Before we crack on there are a couple of things that might need saying. 1. Full disclosure: I am a fan of Greg Gilbert’s work as a musician. 2. Has there ever been a successful/good book of poems written by a musician? And furthermore, should a backstory be required in order to fully appreciate a book? Whether it is or isn’t is a question that will be up for debate till the end of time, but it is fair to say that this book comes with more backstory than most. In 2016, Greg Gilbert was diagnosed with stage 4 bowel cancer plus secondary lung cancer and turned to poetry and drawing as a means of coping and understanding what he was going through. The book is a mixture of poems and prose poems and begins with everything appearing to be well. “Saturday, 1st August” has a pastoral feel to it, with its mentions of ‘wilting gold’, ‘dry grass’, and fields. However, there’s a threat lurking beneath this poem in adjectives like ‘wilting’, ‘hissing’, ‘bleeding’ and the last line ‘and from here all summers broke’ throw us straight in at the deep end. And it doesn’t let up from there. Death, fear and the fear of death are ever-present, but we are also introduced to Gilbert’s companions on his journey. The people that are experiencing Gilbert’s illness are essential parts of the story: we meet his mum and dad, his children, his partner, his surgeon, fellow patients, his brother and his cancer. I’ll try not to doubt. The teeth of ecstatic horsemen. It’s worth noting that the stanza quoted above has run on from the first, and that we only reach the full stop at the end of ‘horsemen’ after thirteen lines. There are two points of punctuation in the first stanza, with the first one coming after two words, so even if they are short lines this is still quite a challenge to read aloud. In this respect it is typical of the whole collection which is filled with long sentences and lines that run into each other like a rush of unfiltered thoughts tripping over each other to get out. This can be a bit confusing/hard to read when every line is capitalised. This reads as a stylistic tic rather than as something essential to the poems. The sun as a molten finger through the window is a beautiful image, and the distraction of the chatting couple all makes sense, but does the ‘changes of faces’ mean new people coming in? And I get lost at ‘This a lever of life, why not if you have the talent / And skills’. Why not what? Change face? I’m a coward and besides, love. This is a wonderful summation of the whole collection, the threat of dying and fear of our own thoughts can be incapacitated by humanity and by love. 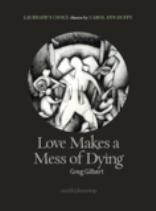 I hope that Gilbert is able to maintain his health and recover from his illness as there is a fine poet at work in this collection and I believe his next work will be a huge leap forward.